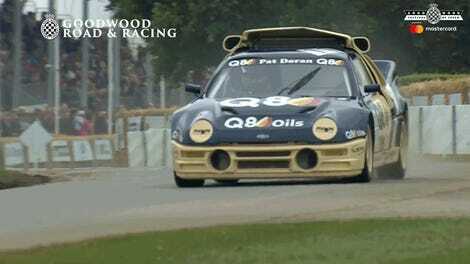 Last year at Goodwood, British rallycross driver Pat Doran ate it in a Ford RS200. 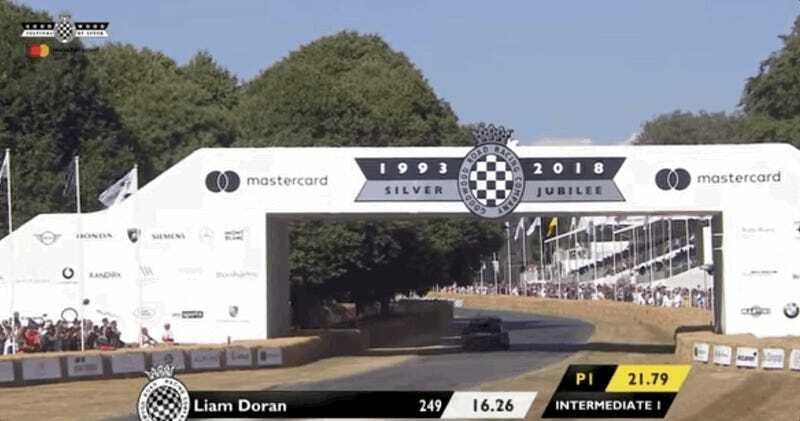 This year Pat Doran’s son Liam suffered a similar misfortune, also in an RS200, though this time the trouble was less eating it than getting pantsed. You can probably imagine—yes, you, someone who’s probably never driven an RS200 at extremely high speeds—what losing the entire rear bodywork of the car would do to the car’s aerodynamics. This crash is a brief testament, in fact, to how much rear bodywork does affect downforce on the rear wheels. This particular RS200 is a 925-horsepower Pikes Peak challenger with the engine bored-out from 1.8 to 2.4 liters. It pushes out a massive 700 pound-feet (949 Newton-meters) of torque to enable a sprint to 60 mph (96 kph) in an almost unbelievable 1.7 seconds en route to 160 mph (257 kph). Liam was fine after it was all over, according to Motor1, the car, not so much.